The three weeks between Betsy DeVos’s unforgettable January 17th HELP Committee hearing and her 51-50 floor vote on February 7th were exciting ones for reporters covering the nomination and everyone else who was trying to keep up with the hectic pace of events. At the start of the new Congress, the demoralized Senate Democrats had targeted eight Trump nominees as potential confirmation fights, including DeVos, Donald Trump’s nominee for Secretary of Education. And for a time, it seemed as if DeVos was the White House’s most vulnerable pick. And of course there was the eye-popping amount of letter-writing, phone calling and other forms of protest. There was the Utah woman who sent a pizza to encourage her senator to vote against DeVos. There was the effort to raise funds and “buy” a senator’s vote. There were the faxes. And there weren’t any major factual errors, despite the hectic pace and unprecedented nature of interest and controversy. Where the coverage could have been improved most was in its level of political savvy and restraint. 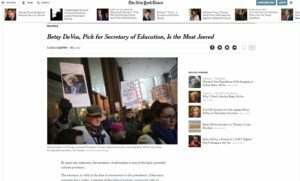 As a result, news readers and activists who thought that the anti-DeVos effort had a real chance through that last weekend before the vote may have been surprised and disappointed – and news outlets missed a great opportunity to provide more credible coverage and explore other, more important issues surrounding the nomination. From the January 17 hearing through the February 7 approval, much of the mainstream media coverage suggested that DeVos was in serious if not imminent trouble: Her support was crumbling. A surge of phone calls imperiled her confirmation. The vote count in her favor was shaky. Like a short-term version of the pre-election narrative that Hillary Clinton would defeat Donald Trump, the notion that the DeVos nomination was hanging by a thread became a media truism. The sentiment wasn’t hard to understand. Democrats were hungry for a scalp. Anti-Trump activists were pressing them to do more. The teachers unions were more than happy to help. Resistance was having results on other fronts. Opponents had nearly a week to win just one more vote. Defeating DeVos must have seemed so achievable. However, the greatest period of actual danger to the DeVos nomination was probably no longer than the 48 hours or so between the contentious 12-11 committee vote to approve her and Thursday afternoon, February 2nd, by which time the half-dozen “on the fence” senators had all confirmed their support and Majority Leader Mitch McConnell started re-arranging the floor schedule. To political reporters and Hill insiders, at least, it was apparent after the stage-managed defections of Senators Collins and Murkowski after she’d gotten out of committee that no more Republican votes against DeVos would be forthcoming. Defections against party leadership and a same-party White House are extremely unlikely this early in a new Congress – especially so on such a high-stakes issues as a nominee’s fate. Votes are rarely held on the Senate floor if the outcome is not already known. A Jim Newell piece in Slate published just before the vote noted how politically expensive it would have been for any Republican senator who joined the Democrats and scuttled the DeVos nomination. Democrats “never had a chance,” according to Newell. If the DeVos nomination would have gone down, it wouldn’t have been just one more person coming out against her, said Newell in a phone interview this week. It would have been done in a series of backroom meetings with Republican leaders, after which the White House would have been advised to withdraw the nomination. Most of all, there was never any solid evidence that additional Republicans were wobbling – just a never-ending series of rumors that persisted long after having been knocked down. In all likelihood, Collins and Murkowski had sought and received permission from Senate leadership to go against DeVos on the final vote – but not before. Nobody else seems to have asked for – or received – permission to vote against her. This theory appeared in EdWeek on Friday, February 3. That same day, CNN was reporting that DeVos had been promised support by all 50 remaining Republican senators. But in its February 3rd story, the New York Times was still calling the DeVos nomination “imperiled.” It portrayed DeVos as “one swing senator away from an embarrassing rejection” as though there was a realistic chance of that happening. 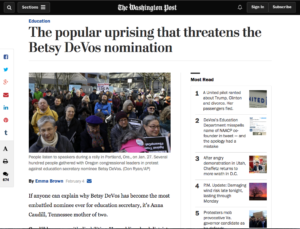 The Washington Post’s February 3 story described “a nail-biter for the confirmation vote.” On the 4th, the Post went even further, describing how a broad-based uprising was threatening the DeVos confirmation. 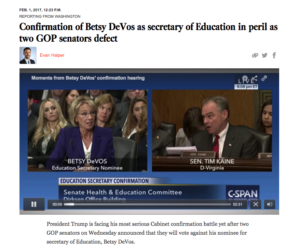 That the Republican leadership had secured the necessary votes for DeVos wasn’t made prominent and explicit except in some smaller outlets like EdWeek and The 74, which reported that all of the “on the fence” senators had confirmed their support for DeVos a full five days before the final vote. In recent days, several observers have raised questions about the wisdom and appropriateness of Trump opponents focusing on DeVos in the first place. Why was there so much speculative coverage of the outside possibility that the DeVos confirmation might get derailed? The confusion is understandable. The protest against DeVos had become a major storyline. It was hard to imagine such an enormous level of opposition not leading to some sort of result. You never know. These kinds of high-conflict, pseudo-cliffhanger situations can be irresistible for journalists. It can be hard to confirm backroom deals in the Senate. And of course, few education reporters live to write about politics and government. Most reporters assigned to the story don’t spend much time reporting on Congress. Newsrooms, like schools, can suffer from lack of coordination among reporters on different beats. “One of the problems with reporting on this is that in education we have a lot of folks who report on education but they don’t always get into the offices of the elected officials who are not on the education committees,” said Dropout Nation editor RiShawn Biddle, who nonetheless thought that the coverage was generally good (and praised reporters at Politico, the Washington Post, Politics K-12, and BuzzFeed in particular). Even within the inaccurate “cliff-hanger” narrative, there were lots of potential stories that got missed until they happened or left unexplained after the fact. The Murray gambit to block the confirmation vote in committee seemed to catch everyone by surprise, even though Democrats in other committees were doing similar and even more extreme things. (Then again, it seemed to catch the majority staff by surprise, too.) Where was DeVos during the interminable gap between her hearing and the final vote – and what was she up to? There was little if any coverage of the substance of the DeVos visits with senators before the floor votes, as we’re currently hearing about Supreme Court nominee Gorsuch. Did the meetings go well or poorly? We still don’t know. What else got missed or pushed aside? Reporters covering the DeVos confirmation did a great job covering the protest against her but could have done much better at debunking the possibility that the nomination would fail — and leaving themselves time to report and describe the next-level dynamics and issues in play. Continuing to suggest that DeVos might lose might have been what her opponents wanted to hear in the short run, but undercuts readers’ trust in news coverage in the long run.